1. Mash the potatoes with the onions, cheese and seasoning, and mould into 2 cakes. Heat the oil in a frying pan and fry the potato cakes for 3 minutes on each side until golden. 2. Meanwhile, poach the eggs according to taste. Cook the asparagus in boiling water for 4 minutes until just tender. 3. Mix the mayonnaise and crème fraîche together. 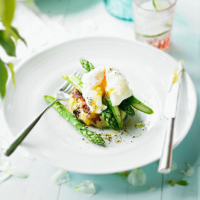 Place the asparagus on top of the potato cakes, top with the eggs then spoon over the garlic mayonnaise and serve.